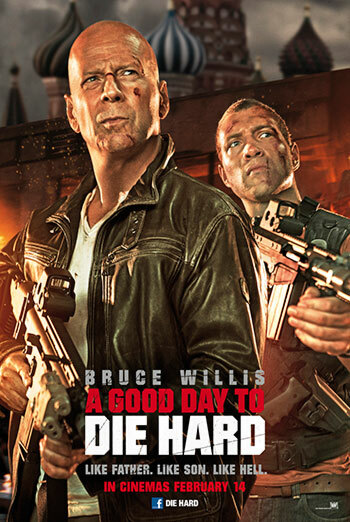 A GOOD DAY TO DIE HARD is the fifth film in the DIE HARD action franchise starring Bruce Willis, in which a New York City cop travels to Russia and joins forces with his son to foil a nuclear weapons heist. The film contains strong language ('f**k') and a partial use of ‘motherf***er’, the end of which has been cut short so the implied strong language is not heard in full. Against a backdrop of explosions, car chases and the destruction of property, some scenes featuring shootings occasionally show brief bullet impacts with no focus on blood or injury. In scenes of hand-to-hand combat, we see brief punches and kicks as well as an implied neck break. There are also passing references to 'doing drugs' and some mild innuendo. This work was originally seen for advice in an unfinished form. The company was advised that the film was likely to receive a '15' certificate but that their preferred '12A' classification could be achieved by making a number of cuts to both language and visuals. When the finished version of the film was submitted for formal classification, edits had been made to reduce the number of uses of strong language (both 'f**k' and 'motherf***er') and to reduce sequences of bloody violence, including blood sprays when characters are shot in the head, and punches to restrained individuals. The formal submission was consequently rated '12A'.